General Dwight D. Eisenhower described the LCVP landing craft as the most important war-fighting tool of WWII. With more than 20,000 landing craft of various design produced by the Higgins Boat Company alone, and with a crucial role to play on all fronts that US forces operated, this was not an overstatement. Squadron/Signal's book, "WWII US Landing Craft in action", is an interesting introduction to the subject. In common with other books in the "in action" series, this title comprises 50 pages plus soft covers in landscape format. The attractive colour plates on the covers, plus the six colour profiles inside, are by Don Greer. Additional line drawings provide details to distinguish the various types of landing craft and scrap views of important details. The backbone of the book, though, is more than 100 photographs of all types of landing craft in action globally during the Second Worlds War. The complex logistics of operating and landing these vessels is well conveyed in the many images of cluttered beachheads. Camouflage and markings of landing craft was quite varied and, in the case of some Pacific examples, quite wild. The schemes are described in captions and some of the more interesting examples are illustrated in colour. The entire range of WWII US Landing Craft are covered, from the small LCP, to the unimposing but stratgeically critical LCVP, through to the larger LCM, LCT, LCS, LCI, LSM and the huge LST - the Landing Ship Tank dubbed by its crews "Large Slow Target" for obvious reasons. Some of the most spectacular photos in the book show LCTs lashed to the decks of LSTs. 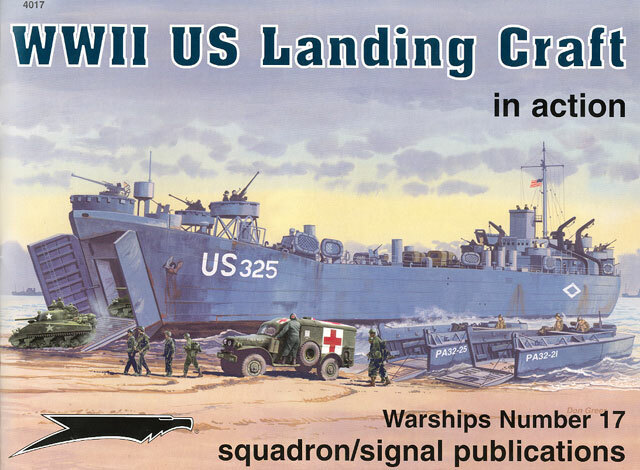 "WWII US Landing Craft in action" is a handy introduction to the subject. The colour profiles provide inspiration for the modeller, and the photos highlight plenty of detail. At less than USD$9.00 it is also typical of the good value of Squadron's "in action" series.